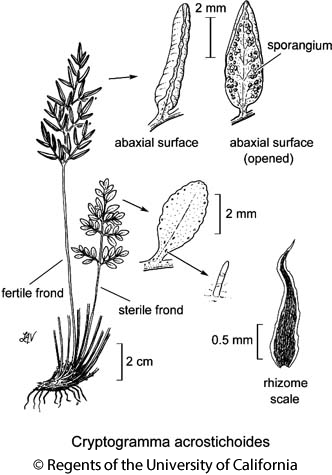 Habit: Perennial herb, in soil or on or among rocks; rhizome creeping to erect, scaly. Leaf: generally all +- alike (or of 2 kinds, fertile, sterile), generally < 50 cm, often < 25 cm; stipe generally thin, wiry, often dark, ×-section with vascular strands generally 1--3, less often many in circle; blade generally pinnate or +- palmate-pinnate (see Adiantum), often >= 2-compound, abaxially often with glands, +- powdery exudate, hairs, or scales; segments round, oblong, fan-shaped, or other, veins generally free. Sporangia: in sori or not, marginal, submarginal, or along veins, covered by recurved, often modified segment margins (false indusia) or not; true indusia 0; spores spheric, sides flat or not, scar with 3 radiating branches. Genera In Family: +- 40 genera, 500 species: worldwide, especially dry areas. Note: CA members of Cheilanthes moved to the distantly related Myriopteris; Pellaea breweri to be moved as well, from a to-be-redefined Pellaea; traditional, often untenable limits of genera outside CA also being clarified using molecular phylogenetics. Habit: Plant in rocky places; rhizome creeping-decumbent, scales brown. Leaf: tufted, deciduous or evergreen, of 2 kinds, fertile more erect, with longer stipes, longer, narrower segments than sterile; stipes dark, scaly at base, tan to +- green, glabrous above base; blades 2--4-pinnate, triangular, lanceolate, or elliptic; veins free. Sporangia: along veins, submarginal, appearing to cover surface at maturity; false indusia linear, from segment base to tip. Habit: Rhizome forming small clumps. Leaf: fertile 10--30 cm; sterile 6--22 cm, blade lance-ovate, +- dark green. Chromosomes: 2n=60. Ecology: Moist to +- dry rocky slopes, crevices; Elevation: 1400--3400 m. Bioregional Distribution: KR, NCoRH, CaRH, SNH, SnBr, SnJt; Distribution Outside California: to Alaska, central Canada, Michigan, Colorado, New Mexico. Citation for this treatment: Ruth E.B. Kirkpatrick, Alan R. Smith, Thomas Lemieux & Edward Alverson 2012, Cryptogramma acrostichoides, in Jepson Flora Project (eds.) Jepson eFlora, http://ucjeps.berkeley.edu/eflora/eflora_display.php?tid=21329, accessed on April 19, 2019. KR, NCoRH, CaRH, SNH, SnBr, SnJt; Markers link to CCH specimen records. Yellow markers indicate records that may provide evidence for eFlora range revision or may have georeferencing or identification issues. Purple markers indicate specimens collected from a garden, greenhouse, or other non-wild location.